Situated behind the Morant Bay Court House overlooking the harbour is the Morant Bay Fort. The fort which was probably built in 1758 was designed for nine guns. The fort is built of brick and cut stone approximately four inches thick. The guns were mounted on elaborate cast iron carriages. 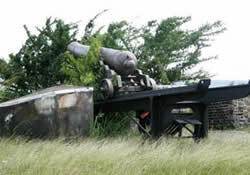 The 3 guns that remain are 24 pounders manufactured in the early 19th century. At one time there was a magazine and a barracks attached to the fort. The fort as well as the courthouse was the scene of trouble during the 1865 Morant Bay riots.